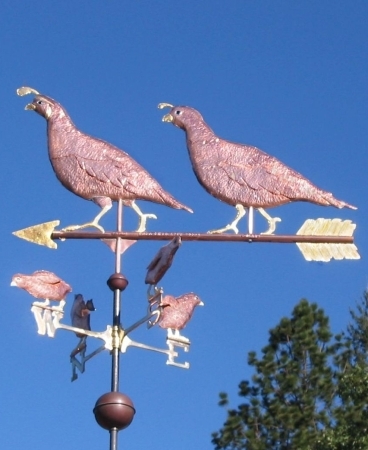 In the Quail Weather Vane Family with 3 Chicks, Coturnix coturnix, the family can be detailed to represent either California Quail or Gambels Quail, depending on which bird is native to your area. 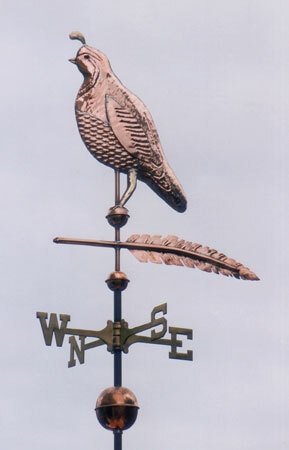 We can use optional gold leaf to accent the distinctive markings for which each bird is known. 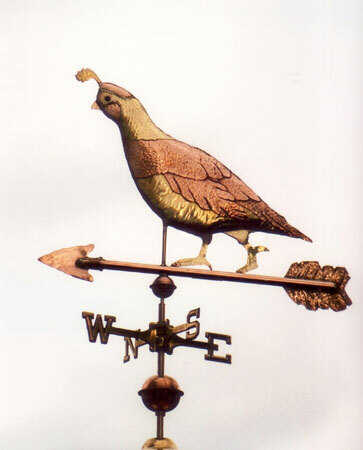 Our most popular gilding option is to do the topknot, beak and legs. 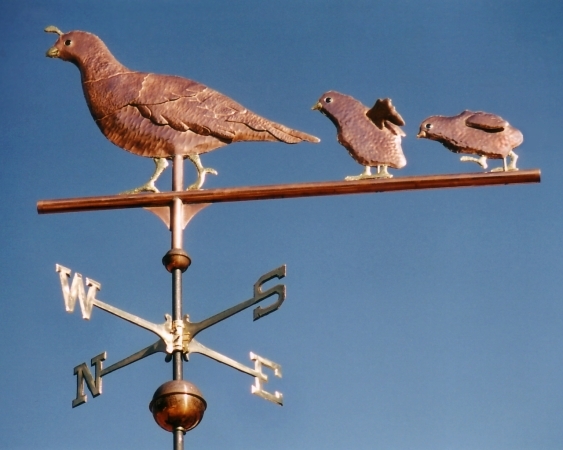 Some of our favorite versions of this design have been commissioned by families. 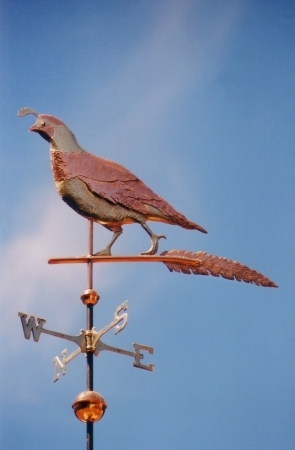 There is a tradition dating back to the Victorian Age involving the inclusion of ‘lucky’ pennies inside a copper weathervane. 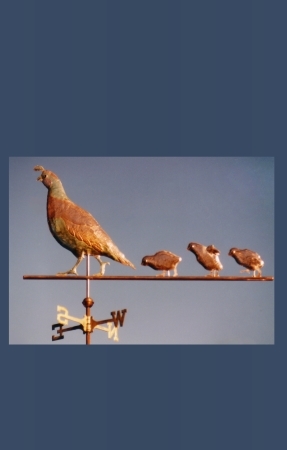 With this design, we can put ‘lucky’ pennies from the years the mom and dad were born inside the parent bird and corresponding pennies for the birth years of the children inside each chick (and we can vary the number of chicks included as well). 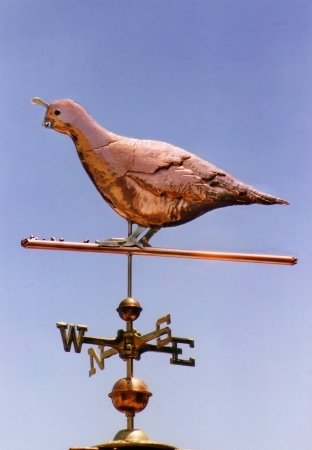 We have also stamped names next to each bird and had family members choose the individual eye color for ‘their’ bird. 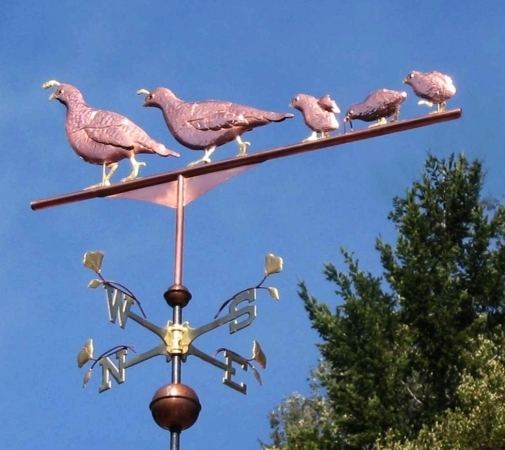 Several customers have commented that with these personal touches, they intend to keep the weathervane in the family and hand it down from generation to generation. 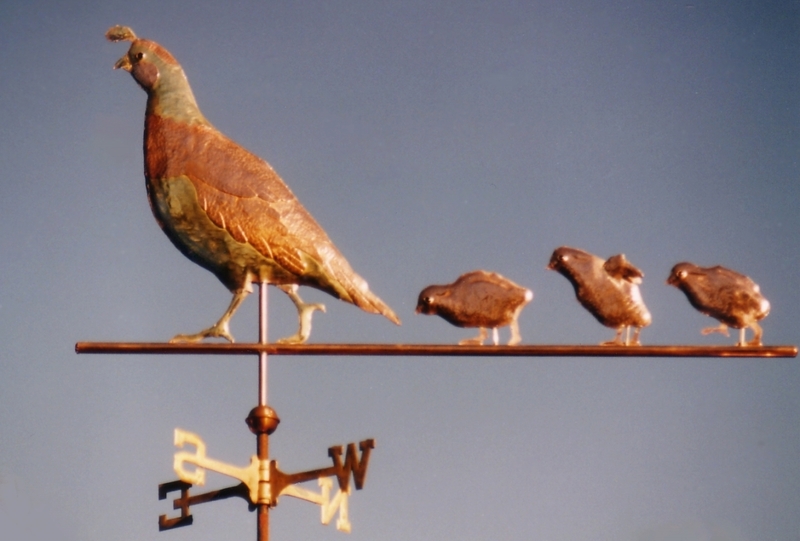 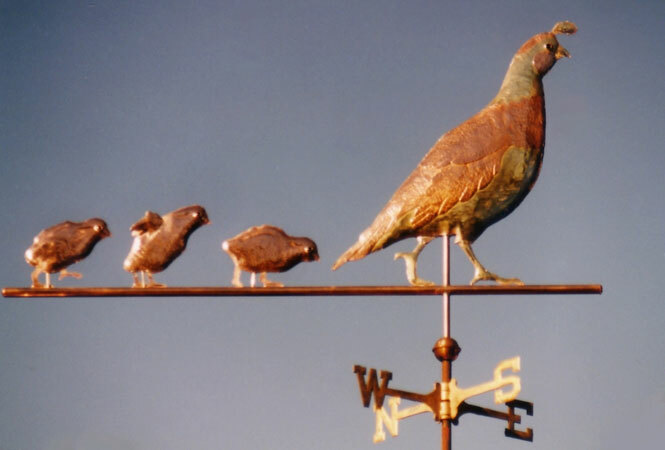 Of note, any time a weathervane sculpture piece consists of multiple design elements (in this case the parent quail and three quail chicks) each of the individual elements is smaller within the overall design than a weathervane that contains only one solid design element (for example, a grizzly bear). 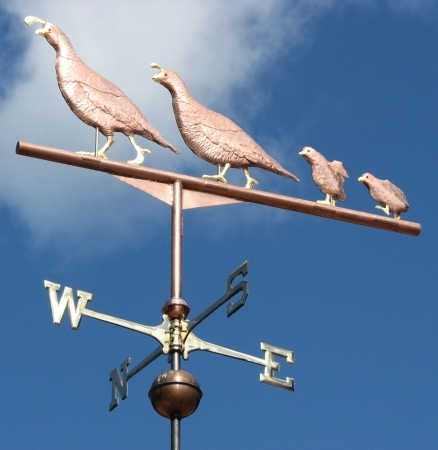 This may influence the size weathervane you would select for your particular installation environment, particularly if you are in between two sizes, as referenced in our Sizing Guidelines. 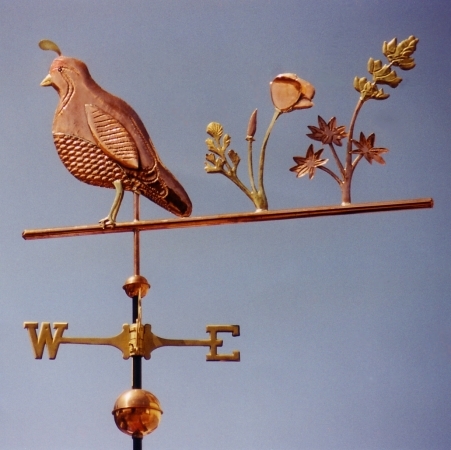 Because of this design’s popularity we offer a number of weathervane variations on this theme, including Family of Quail, Male Quail on Feather, Female Quail eating seeds, Female Quail with 2 Chicks, Quail with poppies & lupin and the Traditional Male Quail on Feather. 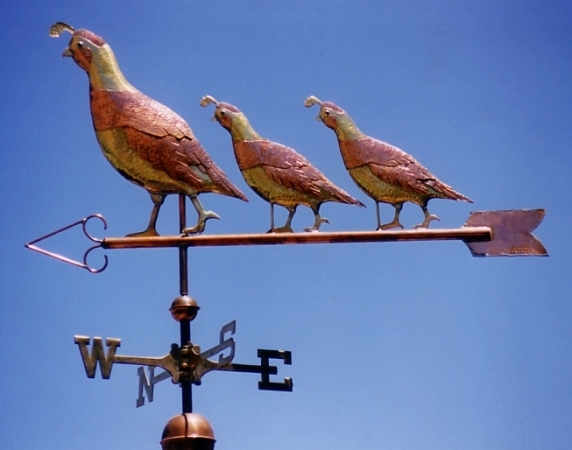 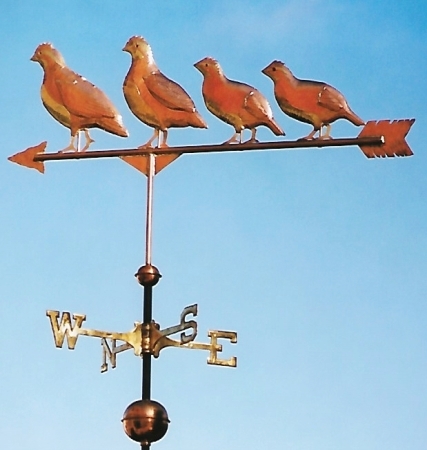 Please let us know if you have ideas about how we can personalize this weathervane for you.